John Hockenberry is a veteran journalist who has excelled in every facet of the profession, from broadcast radio to news magazine television to print as well as being a pioneer in online content. Mr. Hockenberry is also a tireless and internationally known advocate and spokesman for the rights of the disabled. Hockenberry is currently a Distinguished Fellow at the MIT Media Lab. He was one of the founding inductees to the Spinal Cord Injury Hall of Fame in 2005. A cover story Mr. Hockenberry wrote for the July 26th 2005 issue of Parade magazine on the 15 year anniversary of the Americans With Disabilities Act reached 75 million readers. Mr. Hockenberry is a contributing editor for Wired and Metropolis magazines. To talk about an August 2005 Wired story about battlefield bloggers in Iraq he was a guest on The Daily Show with Jon Stewart. Hockenberry has been a stage presenter for national and international design conferences for more than a decade. Most recently Mr. Hockenberry was the on-stage host of the 2006 Art Center College of Design’s RADICAL CRAFT conference and the Biennial Design Conference of the American Institute of Graphic Arts. He was the lead presenter at the International Aspen Design Conference. John Hockenberry joined NBC as a correspondent for Dateline NBC in January 1996 after a fifteen-year career in broadcast news at both National Public Radio and ABC News. 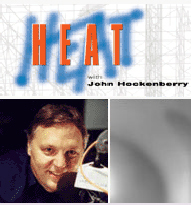 Four-time Peabody Award winner and four-time Emmy award winner, Hockenberry has reported from all over the world, in virtually every medium. He was responsible for the provocative news interview program Hockenberry, broadcast live from the war in Kosovo in 1999, and Edgewise, which blended raw documentary filmmaking with political and cultural interviews. Hockenberry has won an Edward R. Murrow award and a Casey Medal. His Dateline NBC reports include a documentary on the medically uninsured, a portrait of a young schizophrenic living on his own, and extensive reporting in the aftermath of September 11th. Other investigative reports include story of Internet scams that traced swindlers from Nigeria to Toronto and a hidden camera portrait of how Internet pornographers operate outside the law in a global electronic Wild West. Mr. Hockenberry conducted the first and only interview with a Saudi Arabian brother of two of the suicide hijackers on September 11, 2001. Hockenberry is also the author of the novel A River Out Of Eden, and Moving Violations: War Zones, Wheelchairs and Declarations of Independence, a memoir of life with a disability that has been a classic since it was published in 1995. In 1996, Hockenberry performed a successful limited run of Spokeman, a one-man, off-Broadway show he wrote. He has also written for The New York Times, The New Yorker, I.D., The Columbia Journalism Review, Details, and The Washington Post. During the first Persian Gulf War, Hockenberry filed reports from Israel, Tunisia, Morocco, Jordan, Turkey, Iraq and Iran and was one of the first Western broadcast journalists to report from Kurdish refugee camps in Northern Iraq and Southern Turkey. Hockenberry also spent two years (1988-90) as a correspondent based in Jerusalem during the most intensive conflict of the Palestinian uprising. Hockenberry received the Columbia Dupont Award for Foreign News Coverage for his reporting on the Gulf War. Born in Dayton, Ohio, Hockenberry grew up in upstate New York and Michigan, and attended both the University of Chicago and the University of Oregon. He and his wife Alison live in Brooklyn with their two sets of twins, Zoe, Olivia, Zachary and Regan.